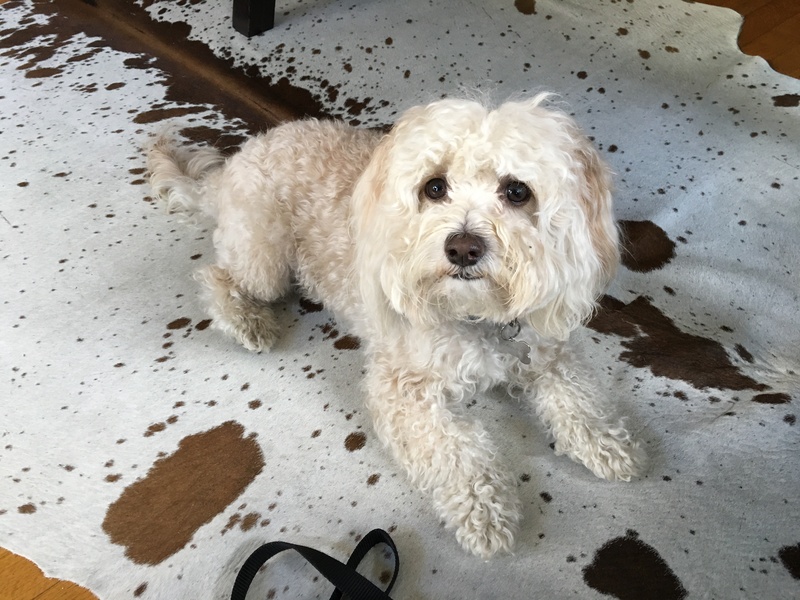 Bowie is a two-year-old Poodle mix who lives in the Miracle Mile section of Los Angeles. His guardians set up a dog behavior training session with me to address a few concerning behaviors; getting aggressive to other dogs on walks, barking and acting aggressively to people passing by and charging the door when guests arrive. I got a first hand example of Bowie’s unwanted barking behavior when I arrived for the dog training and behavior session. The guardian tried to disagree with his barking by repeatedly correcting him before opening the door. I share a tip on why this approach does not work in the following video. Dogs often nominate themselves as a security guard when their humans do not provide them with many rules, boundaries and limits. This lack of structure confuses the dog into thinking they are peers with their humans. This is problematic in two ways. If a dog doesn’t have many rules or boundaries, the humans don’t get into a habit of consistently correcting them for the same thing. Over time this causes the dog to starts to think its in a position of authority. If a dog thinks its in a leadership position, then it feels obligated to contribute to the group. Many dogs think they can best do this by handling security and this was certainly the case with Bowie. I showed the guardians a new way of disagreeing with unwanted behaviors using nonverbal communication cues. I derived these after observing how dogs communicate and disagree with one another so most dogs “get it” right away. After explaining these non verbal forms of communication, I had one of the guardians head out so that I could demonstrate how to use them to claim the area around the front door when someone knocks. By increasing the distance between the dog and the door, we can help turn down the intensity of the dog’s reaction. Additionally, taking over this activity can help the dog start to see that its humans have things under control. When a dog thinks the humans have things covered, then their thinking that they have to alert us to the arrival of a new person diminishes. Next I suggested a number of rules and boundaries for the guardians to introduce to help Bowie start to see them as authority figures. I stressed how important it is to disagree with anything the dog does that they disagree with within 3 seconds to help the dog understand. I also went over my petting with a purpose method to add structure to the way the humans pet and interact with the dog. This will help Bowie transition from a leader mindset into that of a follower. Additional recommendations included using passive training to reward Bowie for engaging in desired behaviors, heading out of doors or down hallways in front of the dog and identifying ways to delay permission or gratification to help Bowie develop more self control. As a dog behaviorist, I always look for ways to incorporate positive dog training and behavior techniques to help a dog better understand what we want. Positive reinforcement also helps the dog learn what we want from them. Failing to teach a dog the desired behavior is one of the most common dog problems I discover when I sit down with my dog behavior clients. Because Bowie was reacting to the sound of the security gate opening right outside his home, I spent a couple of minutes showing the guardians how to use counter conditioning to stop Bowie’s territorial barking whenever he hears that sound. Counterconditioning is a great way to stop a dog from reacting to something it disagrees with. But you have to proceed methodically (at the dog’s pace) and make sure the distance between the dog and whatever it is reacting to is large enough to ensure the dog doesn’t feel threatened, challenged or fearful. Initial practice should be at home in a quiet room free from distractions in short 1-2 minute training sessions (10-15 treats). Once Bowie is looking up at his guardians right away, the next step is to start adding time to the second movement. Next practice session, the first move is 1 second and the second move is 2 seconds. Keep practicing the 2 second delay until Bowie holds his gaze for the full 2 seconds on each treat. Once Bowie is able to help the gaze for 2 seconds, the guardians should go to 3 seconds on the second movement and keep progressing until Bowie will look up at them for 20 straight seconds. Once Bowie reaches the 20 second mark, the guardians should start practicing the Focus exercise while on walks with no other dogs around. This time, the human will randomly give the Focus command and when the dog looks up, deliver the treat right away. After Bowie will consistently look up when the human gives the Focus command when walking, then they are ready to start to practice the command when another dog is nearby, but at a great distance. The human will need to take note of the distance between Bowie and the other dog to identify how far away the dog needs to be at first. Once Bowie is able to be redirected at a specific distance, then the guardian should start practicing while gradually decreasing the distance, one foot at a time. Eventually Bowie will start to associate the arrival of another dog as a good thing as it is always coupled by the arrival of a very high value treat. The key is to practice a lot and only increase the intensity (by decreasing the distance) one small measure at a time. If its progressive enough, Bowie wont even notice the dog or if he does, it wont be a cause for alarm. But in order for the behavior on walks to improve, Bowie’s guardian will need to clearly assume the leadership position inside the house by enforcing rules consistently, providing structure and discipline and helping Bowie practice the desired behaviors in easy, then progressively more challenging situations. Increase Bowie’s exercise, especially early in the day or an hour before any guests are set to visit. Incorporate rules and consistently enforce them within 3 seconds to help Bowie learn that the behavior is unwelcome. Use the Escalating Consequences to disagree with any rule or boundary violations. Practice the door answering exercise with the other guardian, friends and neighbors until Bowie stays behind the boundary to the door on his own. Ignore Bowie when he whines, whimpers or jumps up to demand attention. Pet Bowie with a purpose to help him transition into a follower’s mindset. Use passive training to reinforce desired actions and behaviors. Do not pet Bowie when he is over excited or in any other unbalanced state of mind. Practice the counter conditioning exercise to stop Bowie from reacting to the sound of the front gate opening. Each guardian should practice the Focus exercise 2-3 times a day in short 1-2 minute training sessions. Use the counter conditioning exercise with the cooperation of the neighbor that has a dog Bowie barks at the most. Practice leashing Bowie up multiple times a day so he no longer gets over excited when the leash comes out. Use the Martingale collar and special twist of the leash to better control Bowie on walks. When encountering a dog on a walk before the Focus exercise has been mastered, increase distance. Only feed Bowie after a human eats something first while he waits for permission with food in his bowl.